Answer these questions if you have heartburn when you wake up or after breakfast. Answer these questions if you have heartburn after lunch. Answer these questions if you have heartburn after work or dinner. Answer these questions if you have heartburn before or after going to bed. Use this guide to help you identify and avoid heartburn triggers throughout your day. Answer questions and get a list of personalized triggers, plus recipes and tips on eating out and understanding heartburn. You haven't logged any triggers. Answer questions about your heartburn to get a list of personalized triggers. Choose a time of day to get started. Whatever fast food is your favorite fare, pay attention to portion size. Overeating ups the chances of getting heartburn. It isn't just the coffee that might turn on the burn. Coffee shop fare can contain a lot of fat. If that's one of your heartburn triggers, there is still tasty food for you here. Breakfast is a perfect meal to squeeze in some of your fruit servings for the day. Pick ones that will be kind to you. The less citrus, the better. Some Chinese food may be spicy, but the menu at your favorite restaurant should have plenty of heartburn-free options. Getting heartburn doesn't mean you have to give up desserts. Just fine-tune what you order to avoid your triggers, such as chocolate. If you like gourmet cuisine, you can still enjoy it without getting heartburn, even if fatty foods are a trigger for you. Here, how to cut back the fat, but not the taste. If fatty foods trigger your heartburn, you can still enjoy Greek food. If you love Indian food, don't despair -- yes, it's often spicy, but you can avoid the burn with some wise menu choices. Tomatoes are a common heartburn trigger, and a big part of Italian fare. Eating Italian takes a little creativity to avoid the burn. But you can do it. Salsa is traditional Mexican fare, but if tomatoes kick up your heartburn, you can still enjoy some South-of-the-border dishes. Seafood can be kind to your heartburn -- or cruel. If fried foods are your heartburn trigger, here's what you need to know. Spices are a mainstay of Thai cuisine. If spicy foods trigger your heartburn, choose wisely. Heartburn has nothing to do with your heart. It's a burning feeling behind your breastbone, along with a bitter, sour taste in your mouth. When you eat, food goes from your mouth down a tube called the esophagus into your stomach. In between the esophagus and the stomach is an opening called the lower esophageal sphincter. This muscular valve acts like a door to let food into your stomach. It normally closes quickly behind the food to keep stomach acids -- which break down the food -- from backing up into your esophagus. If that valve doesn't close all the way, stomach acid backs up, or refluxes, into the esophagus. 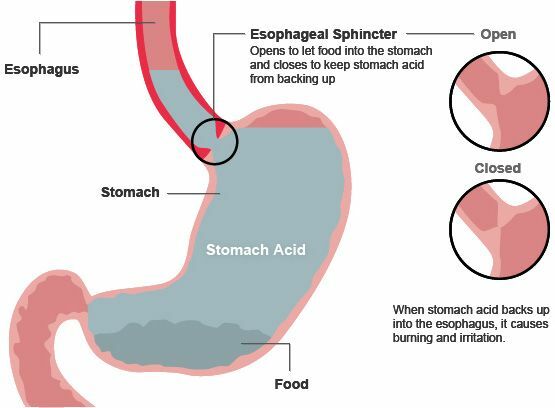 Stomach acid irritates the lining of the esophagus and causes a painful burning sensation. The feeling may be worse after bending over or when you lie down. Certain foods and drinks -- like tomato products, alcohol, citrus, coffee, and fatty or spicy foods -- may be more likely to irritate the lower esophageal sphincter and make heartburn worse. Being overweight, eating big meals, wearing clothes that are tight around the waist, and smoking also raise your risk for heartburn. Learning what triggers your heartburn can help you ease the burn. No recipe is guaranteed to be heartburn-proof. But these will help you avoid the most common triggers — and they're delicious! Select a meal type, a recipe and click Submit above. Family Doctor: "Heartburn," "Heartburn: Causes and Risk Factors." American College of Physicians Special Report: "Understanding and Treating Heartburn." American Gastroenterological Association: "Understanding Heartburn and Reflux Disease." "New Nationwide Survey Identifies Need for Increased Dialogue Between Gastroesophageal Reflux Disease or Frequent Heartburn Sufferers and Health Care Providers." Scleroderma Care Foundation: "28 Tips for Nighttime Heartburn Relief." Harvard Healthbeat: "8 ways to handle heartburn without drugs." American Journal of Clinical Nutrition, November 1975; vol 28: pp 1296-1298. American Academy of Family Physicians: "Heartburn and Indigestion." International Foundation for Functional Gastrointestinal Disorders: "Treatment of GERD." Moazzez, R. Journal of Dental Research, November 2005; vol 84(11): pp 1062-1065. Cleveland Clinic: "Preventing and Managing Heartburn," "Heartburn," "Emotional Wellbeing." National Sleep Foundation: "Myths and Facts," "GERD and Sleep," "Can't Sleep? What to Know About Insomnia." Kaltenbach, T. Archives of Internal Medicine, May 8, 2006; vol 166(9): pp 965-971. Katz, L. Journal of Clinical Gastroenterology, June, 1994; vol 18(4): pp 280-283. University of Iowa Hospitals and Clinics: "Cooking with less fat and oil."